Special illuminations and shows include Niagara’s iconic Skylon Tower – Countless hours of logistical planning and programming have gone into developing the computerized light show for Niagara’s iconic 520 foot tall Skylon Tower. 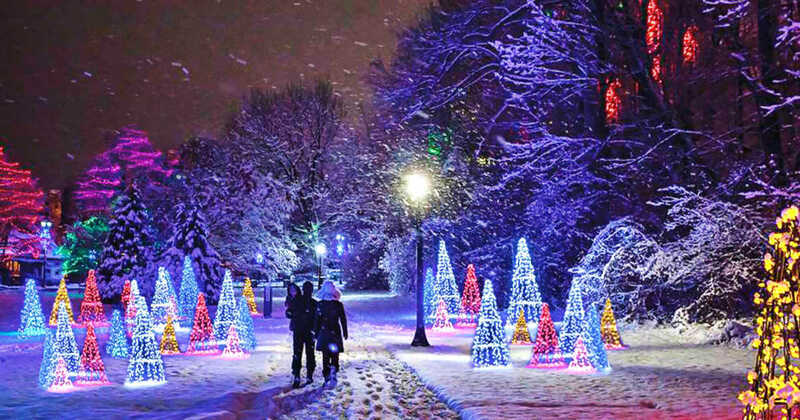 The Special sound and light shows takes place on Fallsview Blvd and laser light shows are offered on specific days. The Winter Festival of Lights opening ceremonies is an event not to be missed. Stunning entertainment, a fireworks show and of course the annual, most anticipated “flipping the switch” to turn on the lights and officially start the new winter season. In 2019 Opening Ceremonies will be taking place on November 16th. Don’t forget to visit us for the Deck the Falls event starting on November 29, 30 December 6, 7, 13, 14! The Winter Festival of Lights will be taking place November 16th 2019- January 12th, 2020. Check out our Niagara Falls events page for more things to do in Niagara Falls.